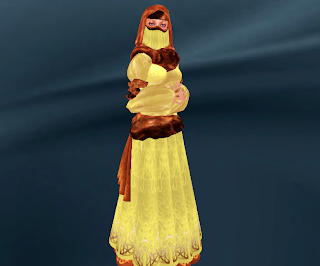 High Caste Ink is offering the Yellow & Bronze version of the Calligraphy Robes of Concealment for only $1L. While stalking a Lucky Chair at Atomic it occurred to me that maybe I should put on street clothes when I go to some of the mainstream stores. Moving on to the freebies: this camisk is a brand new freebie set out by ally Chevalier in her store at Soul Garden. The hair is free just by subscribing to the Mirone Update Group in store. I finally did get the skin at Atomic, it’s not available for sale yet, only in the Lucky Chair. Hair: “MIRONE W/gift ELAN_darkbrown” free by subscribing to the update group at Mirone. Skin: “[ATOMIC] FSkin_LuckySkin_Sunkissed” available only in the lucky chair at Atomic. Analise has sent out a notice that the July Lucky Chair Item is now available, this beautiful white Greek styled camisk. Add the new Fishy Strawberry skin gift, and new eyes from Poetic Colors, and quick trip to the ETD Discount Hair section to get the complete look. Eyes: "Endless Summer" free from Poetic Colors. Hair: "Chandra - Sunny" fatpack (all colors) available for 1L at the ETD Discount Section.